Pirates of New Horizons: Planet Buster is one of those games that have to find their own audience that most probably is going to be few in number. The game might be best for children. But you never know what somebody may like. Maybe there is somebody in the adult audience who is going to like it too. Your booty is represented by coins that you see in the left top corner. You can use those for swaps. 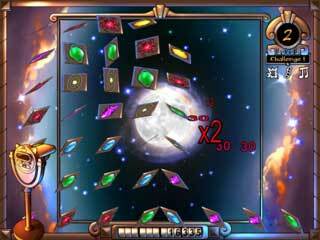 In this match-three kind of game you are to play with different planets and get as much treasure as possible. 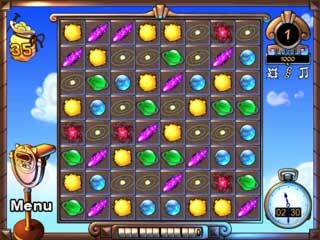 You find all that on the numerous game boards. You travel through the universe with a girl named Annha. She is a kind of a space pirate and as any other pirate her goal is the booty. The game's graphics is the major attraction here. It is bright and colorful that's why it can be a great choice for kids. The music is a bit repetative though. Your booty is represented by coins that you see in the left top corner. You can use those for swaps. Interestingly enough you can swap any tiles on a board. It doesn't matter if the swaps make the matches of three or not. Despite the look and sounds that are more suitable for children, the game really gets better, or rather more challenging after a while. You do have to use logic to get the best score through the match-three moves. Your levels are timed, so it might keep you busy if you are one of those who are excelence focused. You might want to try the free version first to make sure you fall into the category of people who enjoy this one. The person you've qoeutd is wrong anyway and probably a fool. 90% of the people I've talked to about this are always the good guy. The thing is, not only is that trained into us by our parents and pop-culture, it's also a genetic survival trait baked into us- Humans are a social pack species. We form communities, we survive in groups. Part of getting along in groups is ingratiating yourself by doing this approved of by your peers: helping out. That's how we survive and it's how he prosper. It's the basis of our civilisation and it's the reason those who go against it are usually shunned.Even in Machiavelli famous treatise on politics the Prince , people use the wrong context for the quote it's better to be feared than loved . He was talking about rival ministers and nobles who compete with the prince for power. Generally his advice is that it's always better to be loved, or at least to try not to piss people off at you. This is Pirates of New Horizons: Planet Buster review. Download this game here.